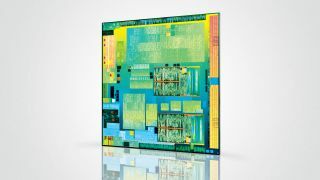 Twice the speed of the previous generation - that's the familiar cry from Intel regarding its latest Atom processor, codenamed Bay Trail. It's the big thing coming out of this year's mobile-focused Intel Developer Forum and so we found ourselves in Intel's Santa Clara offices with a reference design tablet to play with. And, to be fair, Intel might have been a little conservative with this "twice the speed" business. The tablet I had was a reference design device, with a lovely - though occasionally flickery - 2,560 x 1,440 screen. That's the same resolution as my 27-inch IPS screen back home and it looked great on a 10-inch tablet screen. It was also a Windows 8.1 machine, which meant I could grab any of my usual benchmarking suite and really punish the new Atom CPU architecture. Except it wasn't really punished. With a proper 22nm quad-core design and the switch to an out-of-order CPU setup, it's much more in line with the Core processors we've been used to on the desktop and in modern Intel laptops. And so it's far more capable of dealing with the sort of CPU benchmarks that made the previous Clover Trail chips weep silicon tears. Can Intel get Bay Trail into more tablets? When we're talking single-threaded performance, Intel's performance claims hold true. The Atom Z3770 chip that was in my reference tablet was running at a solid 1.46GHz - that's a good chunk slower than the 1.8GHz of the Atom Z2760 of the previous generation. And yet I'm still seeing it delivering twice the performance in my Cinebench R11.5 benchmark. But that's the single-threaded test and the chip I'm running is a bone fide quad-core chip as opposed to the dual-core, HyperThreaded Z2760. And when we take another two proper cores into the equation we're looking at nearly triple the performance in the multi-threaded Cinebench test. That's also backed up by my X264 HD video encoding test too. Both those benchmarks are serious, CPU-intensive beasts and it was impressive to see a tablet chip running them to that extent. In fact the 4W Atom Z3770 is on par with the performance of the 15W quad-core AMD Kabini A4-5000 we've seen in laptops. You know, those same Kabini cores that make up both the PS4 and Xbox One's processor component. I also saw some impressive power testing results too. Compared with a Bay Trail tablet with a lower-res screen and only two physical cores, the Bay Trail reference design is capable of running the same workloads, be they CPU tests or 3D gaming, quicker but at the same sort of power levels. And that's counting both CPU and GPU parts using that hefty 2,560 x 1,440 display. But what about other tablets? That all bodes pretty well for Intel's latest tablet architecture. But, to be fair, the problem for Intel's tablet program has never been the performance. Intel has generally always been able to claim performance leads over the silicon competition. The big issue then is the fact that Intel is tying Bay Trail in with Windows, and the market for Windows tablets is a lot smaller than for Android devices. Despite being announced here in San Francisco this week, Bay Trail is going to make its first appearance once Windows 8.1 has finally been released. According to Intel sources it should be the same day. Where the latest Atom has a chance though is in the fact that it will run Android too, although not at launch. It's looking like it's going to be a little after the Windows launch for Android-based Bay Trail tablets. Intel says it knows how to work its silicon for Windows, but Android takes a little longer to get right. Still, it's a shame Intel has chosen to focus Bay Trail on the failing Windows tablet ecosystem when it's actually got a really impressive architecture for the Android tablet market. Why not check out Windows 8.1 release date, news and features?